Without doubt the most powerful and genuinely useful percussion app on the App Store right now. Innovative, feature-laden and packed with great presets. Beep Street's follow-up to Sunrizer Synth utilises the iPhone/iPad/iPod touch microphone as the trigger input for a surprisingly powerful and totally editable dual percussion synth, hosting range of engines including physical modelling and FM, and designed primarily for percussive tones. "Put your iDevice on a table and tap, slap and generally percuss near it to trigger and control the sound"
Put your iDevice on a table and tap, slap and generally percuss near it to trigger and control the sound. Different types of 'stroke' (and thus input sound/envelope) bend and shape the synthesis with expressiveness and playability astonishingly close to that of Korg's mighty Wavedrum - one-finger slaps give tight/ bright tones, while heel-strokes or multi-finger hits give bassier reports, for example. Layered loops (up to six tracks, but also including overdubbing of multiple sounds on each track) can be recorded on the fly, while the Live recording mode simply captures everything you do in the app until you stop it, ready for transfer via iTunes or AudioCopy/ Paste. "Plenty of superb preset sounds are included - the 'Ethnic' bank (conga, tabla, etc) is our favourite"
Plenty of superb preset sounds are included - the 'Ethnic' bank (conga, tabla, etc) is our favourite, with its 42 drums ranging from fun and usable to dazzlingly eloquent and organic sounding - as are delay and reverb effects. 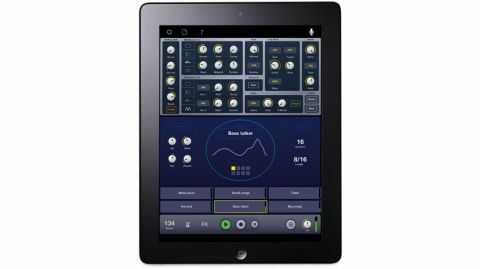 Editable synth parameters include a basic envelope, a wide range of filter types, amp simulation and input shaping. Crucially, the input signal can be used as a modulation source, assignable to any of Impaktor's controls - this proves to be the real key to unlocking its considerable sound design potential. The downside, of course, is that you have to be in a quiet room for Impaktor to work properly, as the supremely sensitive (and latency-free) engine is triggered by any sound. A MIDI triggering option would be welcome, although the results it would give wouldn't be the same, clearly. You also can't edit the sounds after recording, since that aspect is purely audio-based. Other than that, this is an absolute must-have for any iOS musician. We'd love to see a plug-in version!